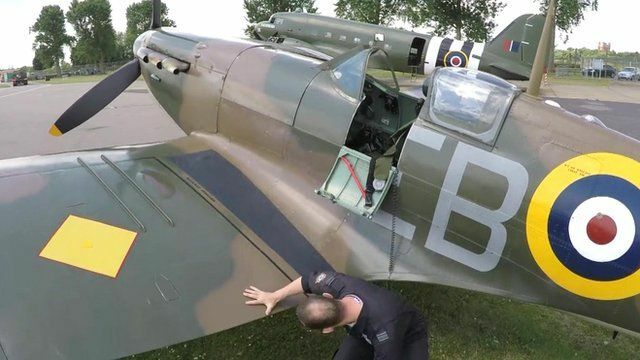 Building a Spitfire with eBay parts Jump to media player John Romain explains to BBC News how he and his team spent three years restoring a 1940s Spitfire to flying condition once again. In-flight film of Spitfire P9374 Jump to media player In-flight film of Spitfire P9374, now fully restored after being shot down during World War Two. Inside new Battle of Britain museum Jump to media player BBC News gets a tour of the new museum commemorating the Battle of Britain in the original 1940 RAF's headquarters of in north London. Pensioners restore WWII bomber Jump to media player Two pensioners from Lincolnshire have restored a rare WWII Lancaster bomber and are hoping to get it flying again. Hunt for Spitfires 'buried in Burma' Jump to media player Aviation experts believe they have discovered dozens of Spitfire planes, neatly packed in crates and in as good condition as the day they were built. Spitfires, Hurricanes and Typhoons will be some of the planes taking part in a flypast over Buckingham Palace as part of this year's commemorations for the 75th anniversary of the Battle of Britain. The BBC's Danny Savage has been at RAF Coningsby in Lincolnshire, taking a closer look at some of the famous aircraft preparing to take to the skies.